Except for the new J-hook option, the technical details of the Sugar Candy Crush are identical to what I described in my post about the original Sugar Candy last year and Leah wrote in her review. Even so, I haven’t touched my original black Sugar Candy bra since the company sent me a Crush to review last month (all opinions are my own). It just feels so much less functional to wear a denim bralette with yellow piping and velvet straps. Don’t get me wrong. This remains an ultra-functional lounge bra, especially with the humid summer we’ve had. Whenever I get out of the shower, this is the bra that makes life bearable until I’m dry enough to put on outside clothes. And if I’m staying home all day to work, it makes me feel like I’ve made a little effort. The velvet straps help with that! 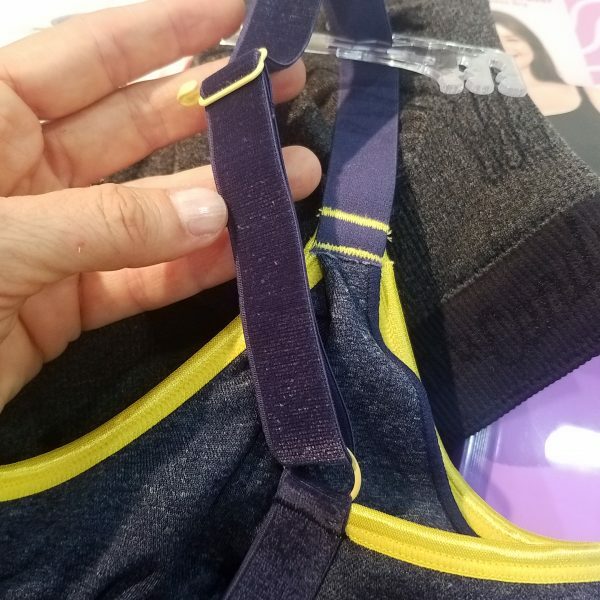 I didn’t expect to like this new iteration of the Sugar Candy bra so much, and I only stopped by the company’s booth at Curve because they’d taken the time to email us about it beforehand. I’m glad I did because more good things are coming from the company. Recently I’ve tried chemises from two new brands that want to give big-busted women pretty yet supportive sleepwear. Unfortunately, neither have quite accomplished the goal. Yet Sugar Candy has accomplished what I’m looking for in their bra. “Has the company ever considered attaching it to a nightgown?” I asked. Not quite a nightgown, but close! They’re coming out with a tank top that I believe goes on sale in November. I probably wouldn’t wear it to yoga class at my YMCA, but I’d certainly wear it to my home office. And if they’d lengthen the tank top to a chemise and make it in a pretty color–like this lace version in navy and blush–I’d wear it to bed. The lace version will also be available in black, and both are coming out in November. Finally, you can check out Holly Jackson’s review of the Crush on Lingerie Briefs. 3 Comments on Sugar Candy Crush is My Go-To Lounge Bra . . . and soon to be more! Sounds great! 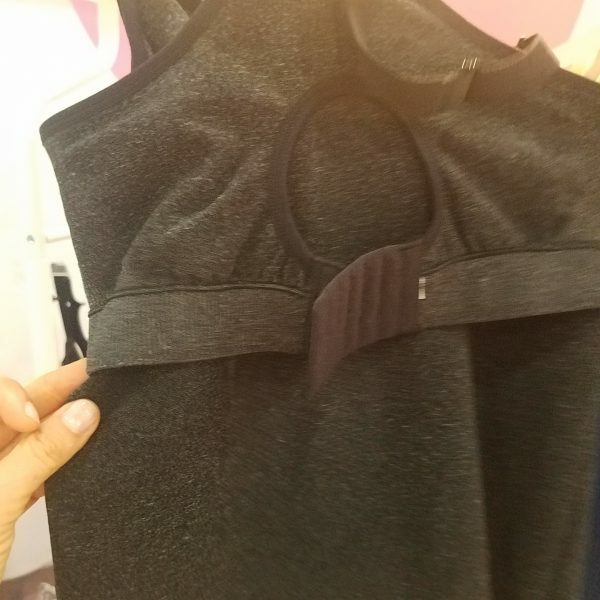 I wear a 30F, does it come in my size? Pretty sure it does. I can’t remember if Leah was an XS or an S. I’m still wearing an M. So I’d think you’d be in their smallest size. I wish more supportive lounge bras came in smaller back compatible sizes. Bravissimo/Panache haven’t cut it in the past and it looks like Sugar Candy is in the same boat (but I like the aesthetics of the lace version.) I ordered a Cosabella to give them a shot but even they stop at 28 and not above what they say is F but I assume is actually G-ish with sister sizing. At least they have a petite option, which is rare.